FastCover is excited to be exhibiting at “N.A.M.E.”, the North American Mining Expo in Sudbury, Ontario on September 12th and 13th, 2018. The event will include cutting edge suppliers and manufacturers offering end-to-end solutions for the mining industry. Open Tech Forums, free sessions, keynote presentations, live onsite demos plus the FREE 2 day Supplier Showcase. It will be a great opportunity for networking, to view supplier innovation, equipment demos and more. FastCover has experience in providing fabric structures for mining operations in the remotest of locations. Our fabric structures, prior to assembly are ideal candidates to be flown or ferried by plane, helicopter, or barge into remote locations. FastCover portable fabric buildings can then be erected on any relatively level site without the need for expensive foundations. FastCover’s fabric buildings can be secured to the ground in a variety of methods from screw anchors to rock brackets to concrete blocks. Whichever method best suits the location, the ground disturbance is minimal or non-existent. In the event the FastCover fabric building is no longer required at a specific location or site, they can be easily disassembled and re-erected elsewhere, making it the perfect storage solution for permanent or temporary mining site buildings. FastCover buildings provide protection against the elements for equipment, core samples and other important assets left on sites. 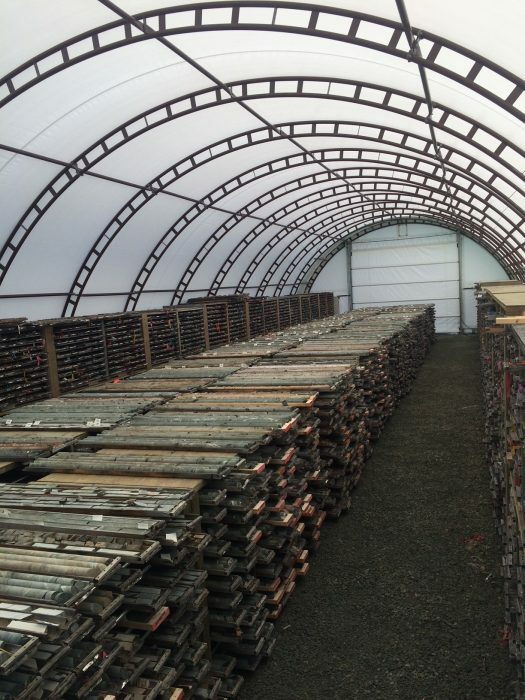 Core samples are a vital asset to the current and future value of the site and need to be properly protected against the elements to minimize deterioration. FastCover fabric structures for mining operations keep trucks, trailers, heavy equipment and other assets out of the elements, allowing for faster and easier startups. No more shoveling snow, unthawing, or digging equipment out anymore! FastCover fabric buildings are the ultimate machine shed storage solution to protect hoses, tires and paint on industrial, mining, transportation and, heavy equipment from fading, cracking, and failing. This allows for longer life, less maintenance and better resale value of the equipment. FastCover fabric structures for mining operations can be easily relocated to another location on your property to adapt to the growth and expansion of your business. Find FastCover Fabric Structures at A-58 in the Arena at the North American Mining Expo in Sudbury, Ontario and browse through our fabric building inventory to see which is best for your mining site needs. I believe that probably I have been talking with you regarding building of Green Houses / Storage in Labrador, NL. when we were at N.A.M.E. Trade Show in Sudbury in September 2018. Probably with the time is passing by and due to other activities, you probably did not find time to send us the quotation as you promised. Since better late than never, I’m very much interested to continue correspondence with you to find a common ground to have a mutually beneficial business relationship with Innu Nation in Labrador NL. Hope to have a favourable response from your side. I have a quote for 4 buildings. 50×100 closed end with door on one end 18×14 and man door. I am looking for a second quote. My humblest apologies for not responding sooner…. technical difficulties!! My name is Neil Fast and I’m devastated that we didn’t reach out sooner. We are incredibly interested but we may have missed the boat, as you say. Please let me know if their is any opportunity to still provide information and costing. Again we apologize for this.Please feel free to call me on my cell @ 1-204-791-5510 or email me at neilf@fastcover.ca. My humblest apologies for the delay in responding… technical difficulties!! My name is Neil Fast and I am devastated that we have not reached out to you sooner. We are incredibly interested in opportunities with the Innu Nation in Labrador NL and wish to speak with you in more detail. I can be reached at our toll free # 1-866-657-7172 or email me at neilf@fastcover.ca. We look forward to hearing from you soon. My humblest apologies for not responding sooner…. technical difficulties!! My name is Neil Fast and I am devastated that we had not responded sooner. We are certainly interested in the opportunity to see if there is an appropriate FastCover at the right price, to meet your needs. You certainly have the option on all FastCovers to upgrade to an overhead door and we would like to know more of your need, if we still have the chance after not responding sooner. If you would like to call our toll free # 1-866-657-7172 or email me at neilf@fastcover.ca that would be great. My apologies again and do look forward to hearing from you.